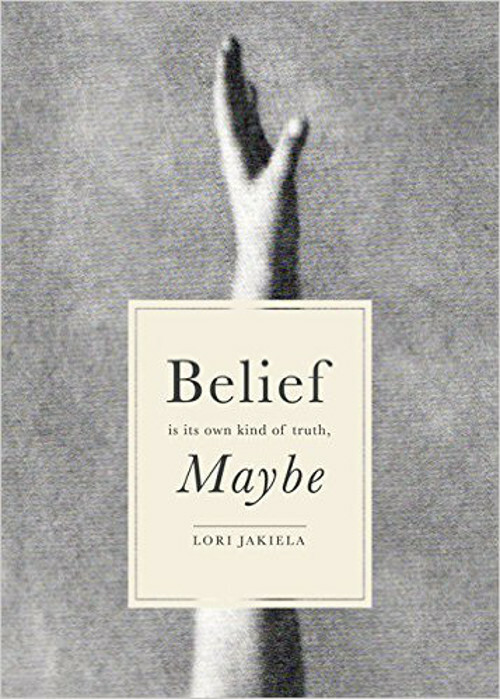 Belief Is Its Own Kind of Truth, Maybe, by Lori Jakiela. Madison, New Jersey: Atticus Books, August 2015. 290 pages. $14.95, paper. Belief Is Its Own Kind of Truth, Maybe tells the story, on one level, of Lori Jakiela’s search for her birth mother. She encounters more than she expects in this search, however, and the story ends up being as much a self-exploration as it is a search for someone outside of herself. It’s a complicated, fragmented, and endearing book built on layers of history and discovery. When my real mother dies, I go looking for another one. The Catholic Charities counselor’s word for this other mother I want after decades to find is biological. Illegitimate is another word for people who end up like me. It’s what I feel now, unlawful, unauthorized, unwarranted here in this office that smells like antiseptic and rubber gloves, hot teeth drilled down to bone. The opening chapter’s scene in the Catholic Charities office is at the beginning Jakiela’s quest to find her birth mother. The counselor tells her, somewhat ominously, “You should know there aren’t any guarantees. Sometimes the stories are happy like on TV. Sometimes they’re not. Most times, not.” Though we don’t know yet how this story will end, we, like Jakiela, have been warned. As it turns out, finding—and getting to know—her birth mother and her birth family is a wrenching experience, one that brings up questions about who she is, who they are, and whether or not it was a good thing to begin searching for them in the first place. Before Catholic Charities has even had time to find her birth mother, Jakiela gets an e-mail message from a woman whose nickname is Blonde4Eva. Blonde4Eva, as it happens, is a dramatic, moody person who claims she’s Jakiela’s sister. They carry on an e-mail exchange that’s threaded through the book, with Jakiela hesitantly trying to get information and details from Blonde4Eva, and Blonde4Eva replying with cryptic messages full of green, highlighted letters and misspelled words. Blonde4Eva’s strange e-mails are nothing compared to the ones Jakiela ultimately receives from her birth mother. This birth mother, Jakiela comes to understand through these e-mails, sounds angry and apparently not at all interested in getting to know the daughter she gave up for adoption many years before. In a series of ranting messages sent from a variety of MySpace accounts—accounts closed not long after they’re opened—the woman writes things like the following: “I want to forget you ever existed. I shut the door on you a long time ago. Go on with your life. Shame on you.” And that’s one of the nicer messages. This, perhaps, is the kind of thing the Catholic Charities counselor had warned Jakiela about from the beginning. The sister’s and mother’s e-mails are only part of the story, however. The story Jakiela tells is a braided tale that includes strands about the mother and father who raised her, her husband and daughter, the birth siblings that she does end up meeting, and ultimately her own history and identity. Jakiela’s book is a masterfully crafted account of the complexity of childhood, the mystery of desire, and the meaning, finally, of care and forgiveness. In this quest story, there’s both a public journey and a private one. The public one is the search for her birth family—a common enough quest. The private one, however, involves her attempt to understand not just who her family is, but how she defines “family,” and what, ultimately, she’s hoping to find. By the end of the braided narrative, Jakiela arrives at a place that neither she nor the reader could have predicted at the beginning of the journey. She’s met a brother who she actually likes. She’s imagined a story that helps her to understand and empathize with her birth mother. She’s explored her “real” mother’s and father’s lives and secrets. And, perhaps most of all, she’s reconnected with her own husband and daughter, who are, after all, at the center of her adult life. In that moment, and in others, Jakiela demonstrates that there can be grace in searching and finding, but that there’s also grace in letting go. Finally, this story is about how storytelling can be used both to solve the mysteries of the past and to move forward, to change, to create a future. In her epilogue, Jakiela says that when writing this book she’d “written and rewritten and revised the first pages because they were blank. All first pages are blank, of course, but for adopted people more so.” With this memoir, those pages are no longer blank. They’re full of vivid stories, and they have much to teach us about how to create a compassionate account of our strange and confusing lives, of our imperfect powers of perception and understanding, and of the flawed and fragile people we love.